Jeong-Eun Lee / Exhibition 2011 - leejeongeuns Webseite! 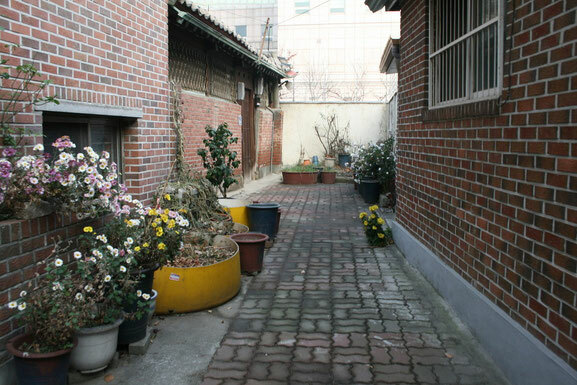 2011년 가을 브레인 팩토리에서 선보이는 ‘순간의 장소’ (Place of Moment)는 독일과 한국을 무대로 활동해 온 작가 <st1:personname w:st="on">이정은</st1:personname>이 1996년도부터 시작한 아카이빙 작업으로, 세계를 오가며 보고 듣고 체험한 삶의 풍경을 지속적으로 기록하여 시간의 자료를 축적하는 온-고잉(on-going) 프로젝트이다. 이번 전시는 지난 16년간 꾸준히 수집한 방대한 자료 중 1996년도에서 2007년도 사이의 작품 5점에최근 신작 14점을 더해 구성되었다. ‘낯선 거리와 길들’이라는 주제 아래 촬영된 싱글 채널 비디오 4편은 나무막대에 그려진 아크릴 스케치 10점과 함께 공간벽면에 띠 모양으로 설치되는데, 옛 책을 상징하는 세로 60센티의 나무막대들이 공간을 둘러 이어지는 일정한 포맷을 유지한다. 이러한 설치방식은 그의 아카이빙이 장소를 옮겨 펼쳐지더라도 일관된 설치가 가능한 최소한의 유기적 장치가 된다. 작은 점들이 모여 선을 이루는 수학적 논리는 공간의 기억을 축적하여 시간의 무게를 쌓아나가는 작가 <st1:personname w:st="on">이정은</st1:personname>이 세로길이 60센티를 기초단위로 일정하게 정리하는 아카이빙 수단의 모태가 된다. 그런데, 여기서 주목할 것은 전시장 내에 프로젝터로 투사되는 동영상을 포함한 모든 작품(기억)에 처음부터 할당된 면적만을 배부한다는 점이다. 특이하게도 그의 동영상은 투사면적이 이미 결정되어 있다. 이는 동영상의 길이가 길고 짧음을 떠나 하나의 영상 혹은 이미지에 전체 아카이빙 중 미리 배정된 몫만을 할당하는 효과를 낳는다. 그리고 이런 계산은 기억의 무게를 배부하는 장치를 설치 면적을 통해 구현하는 독특한 아카이빙의 요소가 된다. 그의 아카이빙에서 도드라지는 또 다른 부분은 구체적인 ‘시간과 장소’의 정보를 탑재한 영상과 빛 바랜 드로잉을 같은 공간 내에서 의도적으로 혼재시켜 시각적으로 어우러지게 한다는 점이다. 이것은 작가가 ‘생각하고 인식하는 나’를 중심으로 한 ‘삶’을 전체적으로 인식하고 시공간을 초월한 ‘본질’ 그 자체로 드러내고자 하는 장치로 작동한다. 따라서 내용과 형식 사이에서 유추할 수 있는 <st1:personname w:st="on">이정은</st1:personname> 작업의 핵심은 본인의 인생을 거시적으로 바라보고 있는 시선이다. 그는 삶의 본질과 개체의 실존에 대한 진중하며 근원적인 탐구를 하고 있는 것이다. 이번에 출품된 영상 4개 중 가장 커다란 비중을 차지하는 작품은2분15초짜리 동영상<시선의 교차&시선의 교차, 예나>일 듯 하다. 이 작품은 작가가 2011년 봄부터 약6개월간 머물렀던 구동독의 도시 ‘예나’에서 촬영된 작품이다. 200 cm의 긴 두루마리 위에 투사되는 이 작품은 메마른 나뭇가지와 낙서가 가득한 회벽, 건조하기 짝이 없는 동독의 일상을 배경으로, 매일매일 사색하는 작가의 일기와도 같은 나레이션이 자막으로 흐른다. 도시의 풍경을 카메라의 눈으로 담은 영상과 이 때 피어 오르는 작가의 머리 속 풍경이 자막으로 나오는 이중적 구조는 사실적 관찰과 주관적 감성을 한 화면에 담아 시문학적 경험을 가능케 한다. 이것은 그의 기록들이 단순한 기록을 너머 서사적 산문의 구조를 선회하는 결정적 이유다. 2011년도 작 <통의동 산책>은 브레인 팩토리 전시장에서 시작하여 동네 한바퀴를 돌아 다시 전시장으로 되돌아오는 짧은 여정의 스틸 사진을 빠른 속도로 이어 붙인 동영상이다. 작가는 통의동의 좁은 골목길을 다니며 한옥과 양옥이 묘하게 뒤섞인 독특한 장소성에 그의 어릴 적 추억을 오버랩 시킨다. 20분이면 한 바퀴 돌 수 있는 작은 동네를 산책하며 작가는 이 작은 동네가 가지고 있는 매력과 특색을 오감으로 느끼고 기록한다. 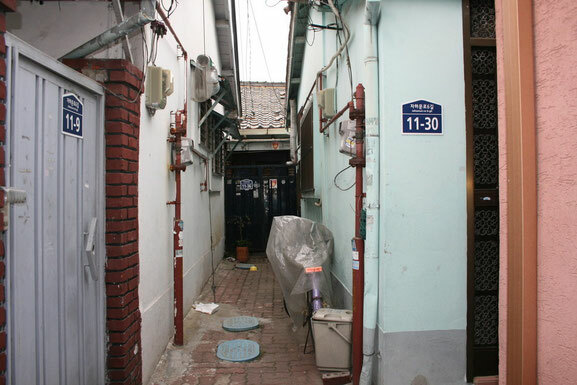 2010년도 작 <후퉁>은 중국의 구성 내에 산재된 골목길을 일컫는 단어다. 철거지역인 ‘후퉁’에서 언제 빼앗길지 모르는 ‘거주권’을 담보로 하루하루를 살고 있는 주민들의 일상을 조심스럽게 촬영한 <후퉁>에서 작가는 생경한 그들의 매일을 덤덤하게 담아내었다. 한편, 2010년도 작 <예컨푀데>는 거리를 다니면서 일상을 촬영했다기 보다는 거리의 행인인 참여자 10인이 작은 배에 메시지를 적어 바다에 띄우는퍼포먼스와 예컨푀데의 겨울풍경이 오버랩 되는 동영상이다. 이 작품은 <배 안의 메시지>라는 타이틀로 황해, 대서양등 서로 다른 지역의 바다 앞에서 총 8차례에 거쳐 행해졌던 퍼포먼스로 희망의 메시지들이 바다 위 얼음이 녹아 내린 수면 사이로 흘러 항해하는 내용으로 이루어져있다. 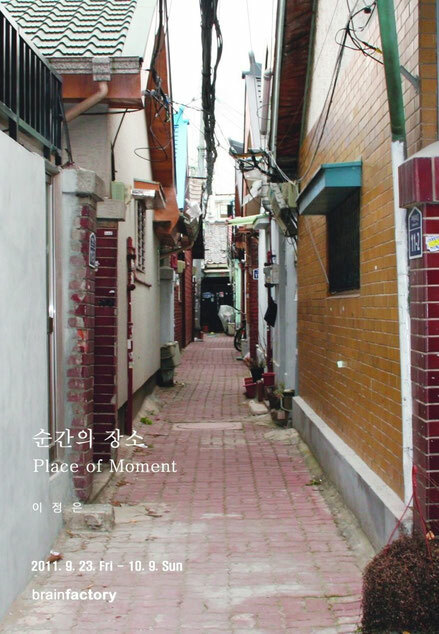 공간의 중요성을 염두에 두고 명명한 전시제목<순간의 장소>(Place of Moment)는 <순간의 기억>(Memories of Moment) 으로 대체 가능하다. 왜냐하면 그와 그의 카메라가 관찰한 장소는 단순히 기계적인 기록을 너머 매 작업마다 항상 일기와도 같은 주관적 감성이 녹아 들어있다는 사실로 인해 ‘그의 존재가 거기에 있음’을 포함한 실존적 장소의 추억으로 기록되기 때문이다. 이러한 맥락에서 그의 작업이 통상적인 다큐멘터리와는 상이하다고 할 수 있다. 그가 차곡차곡 쌓아나가는 “축적된 추억”은 그의 삶이 한걸음 나갈 때 마다 켜켜이 쌓일 시간의 유산이 될 것이다. ‘장소’를 강조한 프로젝트명에서 유추할 수 있듯이 그의 노마딕한 라이프 스타일과 예술가로써 설정한 일생의 프로젝트(life-long project)가 현명한 타협을 이룬 듯 보인다. 삶을 총체적으로 기록하는 그의 작업은 전시 때마다 그 동안의 행적을 펼쳐 보이는 소규모 회고전 (retrospective)이 될 터이니, 10년 20년 시간이 갈수록 내용의 육중함을 더할 그의 작업에 기대를 아니할 수 없는 것이다. 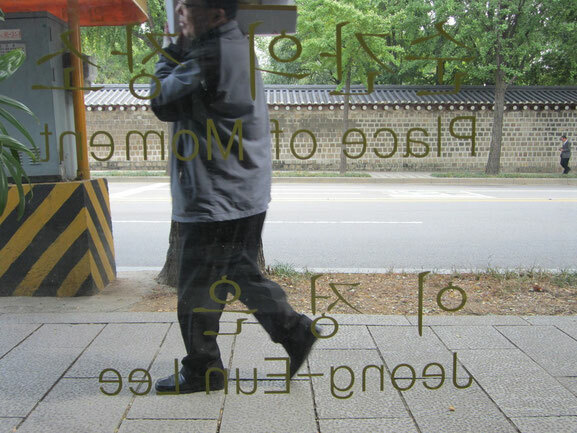 In fall 2011, Brain Factory holds an exhibition titled <Place of Moment>, presenting the archiving works that began in 1996 by Jeong-Eun Lee, who lives and works in both Germany and Korea. It shows an on-going project of accumulating the documentary of time by continuously recording the scenes of life that the artist observed, heard, and experienced while traveling the world. The current exhibition is composed of 5 pieces done in between 1996 to 2007 among the vast amount of records collected in past 16 years, and 14 additional works that are newly created. Four pieces of single-channel videos are installed on the wall in a band shape with 10 acrylic sketches on wood sticks.A regular format is maintained where the 60cm tall wood sticks, representing old books, are wrapping the space around. This kind of installation method becomes the least organic device allowing her archiving to be arranged as coherent as possible even in new exhibition spaces. The mathematical logic of small dots assembling to create a line becomes the matrix for the archiving means in which Lee, the artist who piles up the weights of time by accumulating the memories of space, uniformly organizes the 60cm height units. 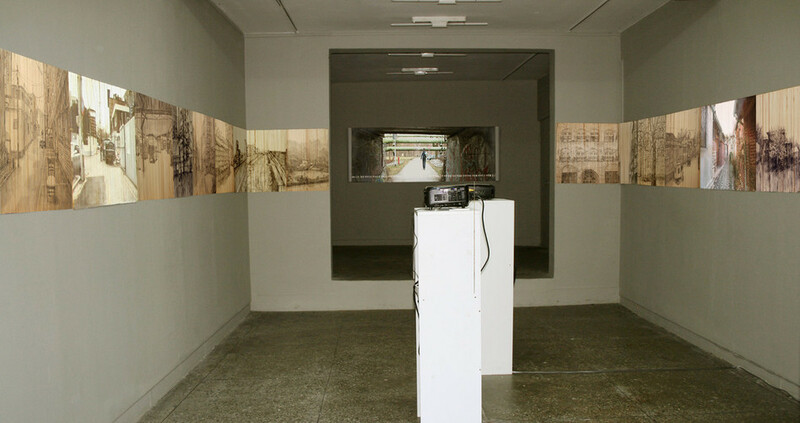 It is noticeable that the artist distributes only the assigned areas to all the works (memories), including the videos projected in the exhibition hall. Interestingly, her videos are ascribed withpre-determined projecting areas. Independent of the length of the videos, it induces an effect of assigning certain proportion of the total archiving to a video or an image. Moreover, this calculation becomes a distinctive element that enables the realization of the device that distributes the weight of memories using the installation area. Another prominent point in her archiving is that her installation intentionally mixes the video, where specific ‘space and time’ information is loaded, and the faded drawings in the same space to achieve visual harmony. It can be interpreted as the artist’s effort to recognize the ‘life’ as a whole with the ‘thinking and perceiving self’ in the center and reveal the ‘essence’ itself that transcends time and space. Thus, the core of Lee’s works that can be inferred from the content and format is the gaze that looks into her life with a macroscopic perspective. The artist is undergoing a prudent and original process of seeking for the essence of life and the existence of individuals. The work that takes the largest importance among the four video pieces would be <The Cross of Gaze &The Cross of Time, Jena>, a 2 minutes 15 seconds long video. 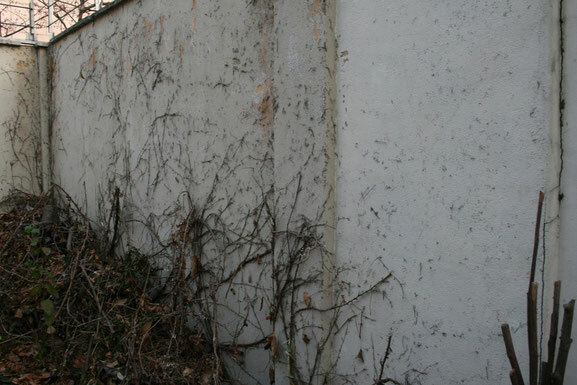 The piece was recorded when Lee has stayed in Jena of the old East Germany for about 6 months since spring 2011. Projected on a scroll paper 200 cm long, with dry twigs, a plastered wall filled with graffiti, and the arid daily scenes of a city as its background, the monologue flows as subtitles like a journal reflecting the artist’s everyday contemplation. The dual structure of the image, depicting city view through the eyes of the camera, and the subtitles, describing the scenes rising in the artist’s mind, provides the viewers with a poetic experience by juxtaposing both the realistic observation and the subjective emotion in one screen. It is the decisive reason why her recordings circle around the prose organization moving beyond simple records. 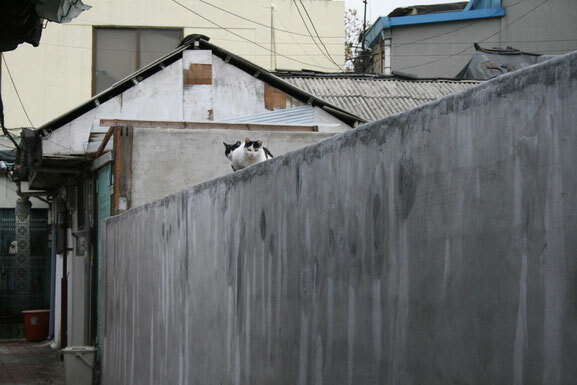 The work <A walk around Tongui-dong>, done in 2011, is a video created by connecting in fast speed the still photographs that Lee took during a short trip. Her journey started from Brain Factory, walked around the town, and returned back to the same place. 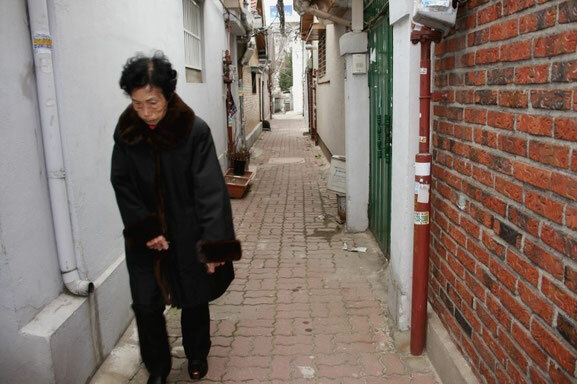 Walking the narrow alleyway of Tongui-dong, the artist overlaps her childhood memories to unusual site where Korean and Western styles of houses whimsically entangled. She felt the attractions and characteristics all five senses and maderecords of the small town where everything can be seen within 20 minutes. The work <Hutongs>, created in 2010, is named after the Chinese word ‘hutong’ that refers to narrow streets in the traditional courtyard residences in China. 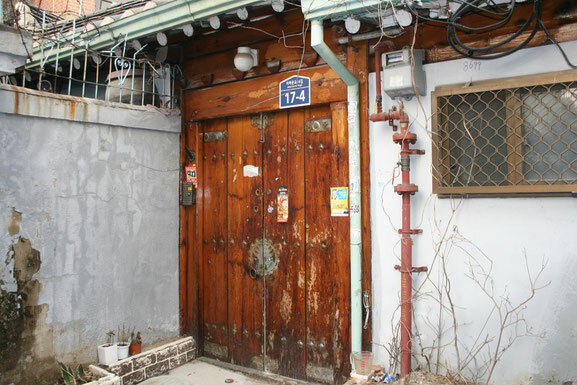 The inhabitants in hutongs are now maintaining their scanty existences with ‘the right of residence’ as collateral. 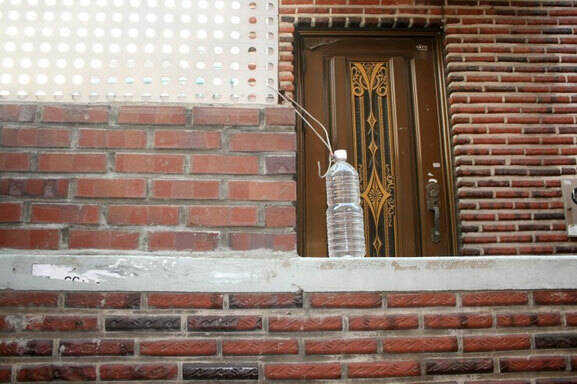 In <Hutongs> the artist calmly shows their crude daily lives that she carefully filmed. Meanwhile, in Echernfoerde, done in 2010, the artist did not shoot the lives by walking on the streets, rather, she recorded the performances where 10 pedestrians participated to write down messages on small boats and sendthem into the sea creating an overlap between the performance and the winter scene ofEckernfoerde. The work shows the performances that took place 8 times at different places such as the Yellow sea and the Atlantic illustrating the messages of hope floating on the ice melting surface and sailing over the sea. 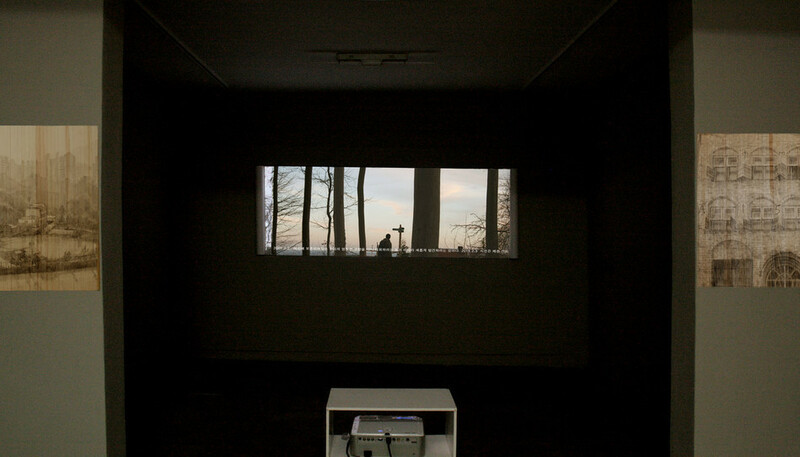 The title of the exhibition <Place of Moment>, which is named to give importance on space, can be replaced by <Memories of Moment>; because the places that Lee and her camera observed were recorded as the memories of the existential places assuming ‘her existence there’, based on the fact that the records were not machinery but intermingled with subjective emotions like her personal diary. In this context, her works differ from the documentaries in general. The ‘accumulated memories’ that she neatly piled will become the inheritance of the times that would be stacked as her life moves on step by step. As can be inferred from the name of the project which emphasized the role of‘place’, her nomadic life style and the life-long project set up as an artist have reached wise compromise. Lee’s works of recording the life as a whole would become a small retrospective at each exhibition, and we cannot help looking forward to her future works in 10, and 20 years that would add up more ponderousness in content. Das Video zeigt in fließend überbindenden Fotos die Landschaft der Umgebung von Jena, in der ich mich in den letzten 5 Monaten aufgehalten habe. Als Ton hört man datierte Gedanken und tagebuchartige Aufzeichnung meiner Erinnerungen - die gleichzeitig als Textband unten durchs Bild laufen. 육 개월간 거주한 예나라는 동독지역의 일상 풍경을 사진으로 담고 왼쪽에서 오른쪽으로 진행되도록 편집했다. 자막인 일기형식과 같은 날짜가 기록된 생각과 기억은 흐르는 풍경 아래에 오른 쪽에서 왼쪽으로흐른다. 비디오 필름은 180센티미터 되는 길이의 종이두루마리 위에 프로젝션 된다. 빛은 바닥으로 부셔져 천 개의 형상으로 내려앉았다. 웅켈 거리에서. 카사브라랑카에 밤이 오면 사람들은 하루 종일 앉아 옛일을 이야기하던 의자를 버려두고 하루를 잊고 어디론가 향해가는 것이다. 창밖의 나무는 밤이 오면 케른 산의 산등성이에 반짝거리는 도시의 가로수면 집들이 환히 밝히는 작은 등들을 두 팔에 한 아름씩 매달고 서있었다. 창문을 통해서. 펠젠 창고거리에서. 겨우내 사용하지 않았던 미끄럼틀은 아직도 뽀얀 눈이 덮여있었고 칭얼거리는 아이소리가 드문드문 들려오는 건물의 벽엔 아이의 빨간 플라스틱 그네가 비스듬히 걸려있었다. 집들은 산중턱에 마치 이처럼 고루 박혀있었고 5시의 노을에 케른 산의 벗겨진 붉은 산허리를 내보인다. 머리에 보존되어있는 우리의 영원한 고향을 다시 재회하려는 것이 아니라 새롭게 발견하려는 것이다. 시선은 케른 산의 산중턱의 분홍색 집을 지나 연결된 산등성이의 굴곡을 따라 힘겹게 올라와 파란색 안테나가 있는 꼭대기에 머물렀다. 이름이 없다고 존재하지 않는 것은 아니다. 다른 이름을 가지고 있다고 다른 길은 아니다. 그리고 나는 오늘도 그 길을 걷고 있다. 2011.2.11별 모양의 보리수가 놓인 길. 시선은 7갈래로 갈가리 찢어져 십자의 구도에 7점들을 이루고 있는 것이다. .강물은 삼단머리를 풀어 놓은 듯 길게 흘러내리고 그 위 나뭇잎 몇몇이 경주라도 하듯 둥실거리면 서로 부딪히면서 떠내려간다. 별빛은 환하게 흩어진 기억 위에 생생히 비추면 빛을 쫓는 나방처럼 옛 기억을 좇아서 날아가는 것이다. 하루에 몇 번이나 빛으로 벽 위에 사연을 써 내려간다. 숲길에서. 그의 생각은 그가 이를 수 없는 곳에 있었다. 나의 지나온 길들은 잔가지를 치고 뻗어나가 우성한 나무를 이루었다. 헤켈거리와루터거리가만나는곳에작은광장이라고할만한칼 사이츠 광장가 거리에 자리 잡고 있는데 섬처럼 자리 잡은 이곳엔6개의문의작은신전같은기념비가덩그러니서있다. 벤치가 띄엄띄엄 자리잡은 가장자리엔 한 노인이 매일 찾아와 글자 맞추기를 하며 낮시간을 보내는 것이다. 봄빛은 여지없이 공사장의 나무이며 철근을 쌓아놓은 곳에 내려앉아 밖으로 노란 머리를 들며 인사하는 민들레까지도 환히 비추어주고 있었다. 새로 산 예나의 지도위로 나의 손가락은 오르막길을 몇 번이나 오르고 작은 계단을 내려가 루터 거리의 길에 서성였다. 골목마다 저녁의 비스듬히 비추는 빛에 집으로 행하는 사람들의 그림자는 시간에 의해 부식된 벽 위에 엉기어 획을 치기 시작한다. 창문에서 무럭무럭 솟아 나오는 고향의 향기가 한길에 가득 퍼져 고향 생각에 행인의 발걸음을 멈추게 하는 것이다. 대문 안을 기웃거리며 서성이게 된다. 낡디 낡은 형상을 하고 있다. 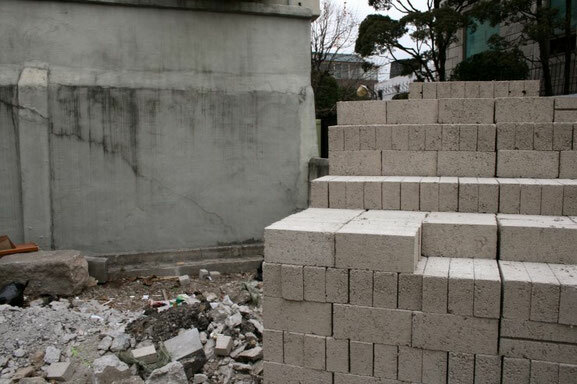 Spaziergang durch Tonguidong 2010, 3'28"
비디오 필름은 2010년 방문한 통의동의 골목인상 풍경을 담고 있다. 난 통의동 답사 겸해서 걷기로 했다. 변수 많은 미지의 세계를 여행 한다. 작가 스스로 걷는 모습은 보이지 않지만 주위 배경은 쉴 새 없이 변화한다. 한 장면 한 장면 시간의 경과를 몇 십장의 사진으로 담아 빠른 속도로 편집함으로써 마치 필름과 같이 움직이는 풍경 효과를 준다. 움직임엔 습관이 있고 본능이 있고 직관, 의식과 무의식이, 목적이 있다. 목적은 형, 움직임으로 나타난다. 사진은 시간의 경과와 함께 움직이는 영상이 된다. 관심에 따라 느낌(맘)에 따라 이미지는 걷는다. 몇 십장의 사진 중엔 흥미 있는 짜임새의 늘 머무르고 싶은 순간도 있지만 밍밍하고 밋밋해 아무 의미도 없어 보이고 아무도 눈여겨보지 않는 이미지들과 엮여 골목의 인상을 드러낸다. 무의미해 보이는 이미지는 경과를 위해 과정을 위해 꼭 필요한 순간들이다. 그물처럼 펼쳐진 골목풍경은 나의 머릿속의 실타래 같은 기억과도 같다. 엮기고 중간 중간 매듭지어지고 아무 맥락 없이 비논리적으로 연장되어 진다. 전시장에서 통의동을 산책하고 다시 전시장으로 돌아오는 짧은 여정(경로)을 통해 골목의 일상 풍경을 개 짖는 소리 빗질소리 주민들의 이야기소리 바람 소리 등 친근하게 음향과 함께 면면히 드러낸다. 그들의 잠든 기억을 깨워 보는 이는 마치 자신이 걷는 것 같은 느낌마저 든다. Tongeui Dong ist ein Stadtviertel in unmittelbarer Nachbarschaft zu dem königlichen Palastareal unterhalb des Bukakberges. Die Gegend hat sich eine gewisse Ursprünglichkeit bewahrt und ist weniger von Abrissen und Modernisierungen betroffen als die Innenstadt, die von Bürohochhäusern und Einkaufszentren dominiert wird. Der Charakter des Viertels ist mit den Hutongs alter chinesischer Städte vergleichbar: Ein labyrinthisch anmutendes Netz enger Gassen durchzieht die überwiegend einstöckige Bebauung: ummauerte, um kleine Höfe gruppierte Wohnhäuser. Der Videofilm zeigt eine Bilderflucht durch dieses Gassenlabyrinth. Ich habe dafür keine Videoaufnahmen verwendet sondern Fotos, wobei durch sehr schnelles Hintereinanderschneiden die filmische Wirkung erzeugt wird - gleichsam eine Art Sog. Das "Hindurchfliegen" durch das Gassensystem kann man als filmische Entsprechung einer gedanklichen Assoziationsreihe oder eines Erinnerungsprozesses verstehen - als ein Eintauchen in verborgene Gehirnwindungen.